Ganesha (or Ganesh) is the lord of hosts, the god of wisdom and prudence. Depicted as a man with an elephant's head, he is worshipped as a remover of obstacles. 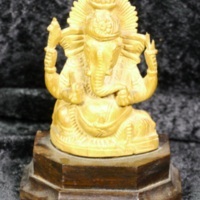 This Ganesha statuette is from India and is carved from fragrant sandalwood.